The Enterprise Manager allows users to see surveys that have been checked into and/or published within a project. Global Survey Events can also be created and managed in this location. The Data Grid displays the status of the surveys (e.g. Published, Suspended). The Edit Survey Icon may be utilized to change the location of a Survey to another Project to which the User has access. NOTE: The actual Publishing and Test Publishing of Surveys takes place in the DatStat Illume Study Manager. Edit Survey Login Workflow Events – Allow Variable Data to be passed from one authenticated survey to another. Authenticated surveys must be associated with at least one participant list. Otherwise, DatStat has no way of knowing who is allowed to take the survey or to whom the data belongs. Anonymous surveys do not need participant lists, since they are open to anyone. The only exception to this would be the case where users would like to send an e-mail job out to all people on a list. In this case, it may be appropriate to associate a participant list to the survey. Log into the Enterprise Manager as either the Local Administrator or a User with sufficient permissions to work with Participant Lists and the projects they are in. In Enterprise Manager as either the Local Administrator or a User with sufficient permissions to work with Participant Lists and the projects they are in. In the Enterprise Manager as either the Local Administrator or a User with sufficient permissions to work with Participant Lists and the projects they are in. Below the Participant fields will be a section displaying the DatStat Discovery Studies that a Survey is associated to. Survey Login Events are used to preload a target survey with data from a source survey. 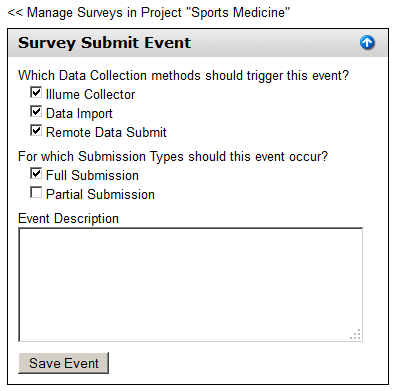 Survey Login Events can also be utilized when a study involves a participant taking a survey at multiple points in the workflow. The Login Workflow Events allow users to specify which responses from a given survey (the source survey) will be passed into a variable (calculation, preload, standard question, etc) in a subsequent survey (the target survey). Users can specify either to preload responses from the most recent instance of the source survey or from the first instance of the source survey. Global Submit Events may be configured for a Survey that may or may not be utilized within a DatStat Discovery configuration. Global Survey Submit Events are used to Add Participants to a Participant List, Update Participants on a Participant List, Assign a Participant to a Derived Participant List, send an Email Alert or send a SMS Text Alert. They occur anytime a survey is submitted. Partial Submission – Any point where the participant has stopped the survey before the end. This event takes place when the data posts from the web server. A partial submission can take place multiple times if the participant starts and stops a survey multiple times. Depending on your system settings, the posting of data from the web server can occur every 10 to 30 minutes. Enter the appropriate information depending on your Action.